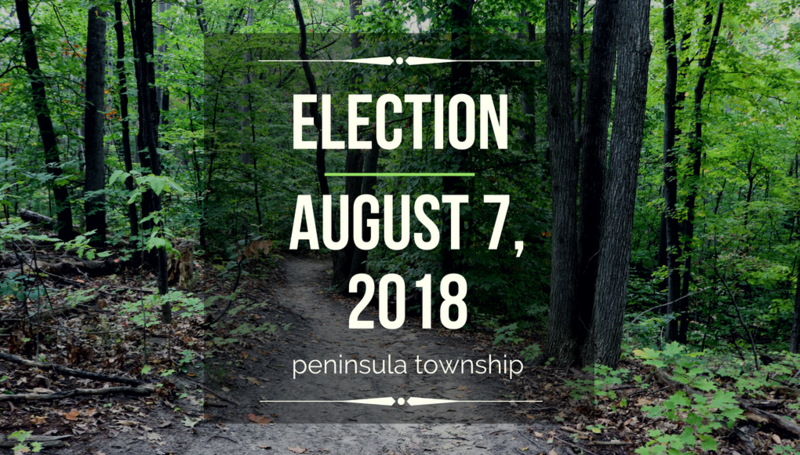 The State Primary election is tomorrow, August 7, 2018, and the polls will be open from 7 a.m. to 8 p.m. Peninsula Township residents will be voting at the Peninsula Township Hall (Precinct 1) or the Peninsula Fire Department, Station 2 (Precinct 2). 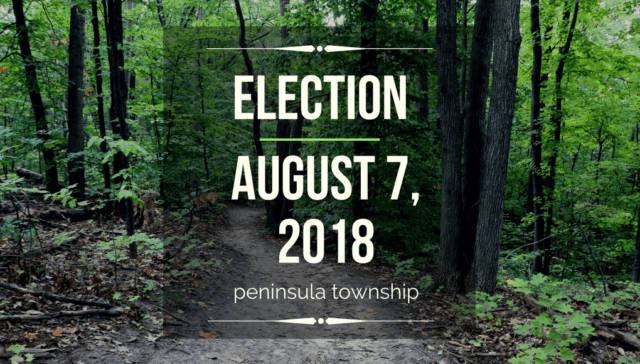 View and Download the Sample Ballot for Peninsula Township Voters here. Note that Michigan voters cannot split their ticket, meaning you can only vote for candidates for one party. Also, remember to bring your ID with you to the polls. Grand Traverse Conservation District Millage Proposal: This proposal for the authorization of a new additional millage will provide funding for the Grand Traverse Conservation District, including programs to assist landowners in the protection, enhancement, and restoration of natural resources, including invasive plant species control, assist agricultural producers in the protection of soil and water and implementation of best management practices on farmland, continue restoration and protection of the Boardman River, and continue environmental stewardship education at the Boardman River Nature Center. If approved and levied in full, the millage of .1 mill will generate an estimated $500,000 to be disbursed to the Grand Traverse Conservation District when first levied in 2018. The estimated cost to a household owning a $100,000 property (SEV $50,000) would be $5.00 per year. Peninsula Township Proposal to Renew Police Protection Millage: This proposal reestablishes the 2/10ths of a mil police protection millage previously approved by the electors that expired after the December, 2017 levy. Specifically, the proposal renews and restores the .0002 mils previously rolled back by the Headlee Amendment. If approved and levied in its entirety, this millage would raise an estimated $140,405 for the Township when first levied in 2018. Local School District Bonding Proposal: This proposal would allow the Traverse City Area Public Schools (Grand Traverse, Leelanau and Benzie Counties) to borrow the sum of not to exceed $107,000,000 and issue its general obligation unlimited tax bonds therefor, in one or more series, for the purpose of: erecting, furnishing and equipping additions to and/or remodeling, furnishing and refurnishing, and equipping and re-equipping existing school facilities; erecting, furnishing and equipping new school facilities; constructing, equipping, developing and improving playgrounds and outdoor physical education, athletic and storage facilities; acquiring, installing, and equipping and re-equipping school facilities for educational technology; purchasing buses; and acquiring, developing and improving play fields, athletic fields and sites. If this proposal is approved, it is estimated that the debt millage for the new and existing bond authorization shall be 3.10 mills for a -0- mill net increase of debt millage. The estimated simple average annual millage anticipated to be required to retire this bond debt is 1.30 mills ($1.30 on each $1,000 of taxable valuation). Next articlePhoto of the Day: Mission Point Lighthouse Keeper’s Office – National Lighthouse Day!